They agreed. 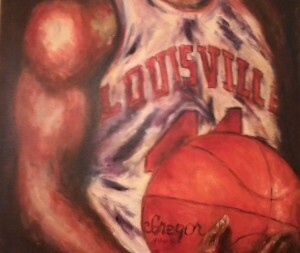 “You can’t beat good teams, going one on one,” observed McCray, as righteous an assist big as ever donned a U of L uni. Noting the 11 rebound discrepancy, I asked if he had any eligibility left? Fortunately, as we well know now, there was no need to suit up the oldtimers from the days of yesteryear. The Cards righted the ship in a big way. There was a seriously dicey start to the second stanza, U of L giving up 7 straight to the visiting Tar Heels, to fall infamously behind by 18 with 17:49 to play in regulation, 25-43. Causing The Rick to call his second timeout of the half. During which, he deftly neither yelled nor scolded, and was totally instructional. Chris Jones drained a trey, then stole the ball, leading to a Terry Rozier deuce. With renewed energy, U of L cut the lead back to a dozen, 32-44, by the first media timeout. For U of L . . . It was the worst of halves, it was the best of halves. Before intermission, U of L hit 7/27 from the field, 8/15 from the line, and was outrebounded by 11, 16-27, surrendering 11 2d chance points. After the break, the Cards shooting was marginally better. 11/33 from the field. 10/16 at the stripe. Louisville grabbed 24 rebounds in the second half, to 15 by the visitors. Of those totals, U of L snared 13 from its offensive glass — I wish my windshield wipers worked as well — turning those into 14 points. Compared with Carolina’s 2 offensive retrievals for zero points. Was North Carolina battered by Louisville pressure as the game wore on? Was Joey in the house shilling for every commercial enterprise between the Yum! and the county line? Do the 138 time National Champion Ladybirds twerk and twirl? Carolina’s mini-burst after that, to push ahead 57-53, could have been fatal. Come from behind efforts as that of the Cardinals yesterday after halftime ofttimes wear a team out, sapping it of its energy. But that Tar Heel spurt was stopped with one of Seedy K’s Big Three Moments of the Game. Quentin Snider hit two FTs to cut the deficit in half. I remember a chat I had back in the 70s with my old college buddy Marc, and his younger brother Paul, who was a student then at Syracuse. Both were and remain major hoops fans. Paul kept talking about how we should develop a TV show that would be nothing but dunking highlights. A half hour’s worth of slams. Which idea I considered ridiculous, nothing but the musing of inebriated, impetuous youth. And I thought fondly of that moment, when reviewing the tapes of yesterday’s tilt, during which telecast, they showed the third of Seedy K’s Big Moments of the Game, four times immediately after the moment, and several times thereafter. Need I spell it out for you? Silent L’s slam cut the Carolina lead to 39-47. More important, it electrified the assembled white-clad crowd. Beside that Dunk du Jour Moment, Montrezl, simply stated, played his best game ever as a Cardinal. 15 rebounds. (8 O, 7 D). Two assists. Two steals. Zero turnovers. While generating enough energy in his 44 minutes of action, to bake all of Benny Impellizzeri’s pizzas down the block from now until the Final Four. At halftime, Rozier and Jones were 2/11 from the field. They got over that. Their back to back treys midway through the second half, cut the deficit to 50-53. TR finished with 22. And 10 rebounds, the most important being a missed MH FT, with a little over a minute left in OT. Jones finished with 17, 5 caroms, and 4 assists. Each had a couple steals. The supporting cast was stellar enough for a SAG Award nomination for best ensemble. Nanu/ Mango contributed 9 boards, 4 blocks and a couple of steals. Shaqquan Aaron had a great steal, and scored five, including a key offensive put back in the second half. In addition to those two major charity scores previously mentioned, Snider was steady in 12 minutes of action without a turnover. So sublime was this comeback W, I shan’t dwell on any negatives. Okay, I’ll overcome my inclination to even passively aggressively mention them. But I can’t not talk about how awful, if not actually fatal, the Sosa play was at the end of regulation. No movement. CJ, obviously and deservedly weary, simply tom tomming the ball at the top of the key. Then throwing to Montrezl Harrell for a three. Rick, you gots to be kiddin’. It was a dumbfounding, inexplicable, unacceptable lapse of strategy. Montrezl Harrell for a trey?????? One guy’s opinion, the Marquette Miracle on Main has been displaced as the biggest Cardinal comeback ever at the Yum!. This one took longer. But it was against a Top 10 team, with a Hall of Fame coach, in a more important game. For the first time in a long while — a long, long, long while — I feel compelled to congratulate the student section. While a C*A*R*D*S cheer or two might have been nice,5 the end zone crowd stayed in the game and was a catalyst. Love, love, loved it when they cut through the incessant and annoying Joey Peanut Toss, WAVE has mini-balls, Kroger Krewe has t-shirts, Smile Cam, Kiss Cam, Hip Hop Dance Time commercial, atmosphere-killing muck and mire with the “I Believe We Will Win” cheer. Ya know, it actually felt like a college basketball game there for a bit, instead of the usual Yum! infomercial. Tuesday @ Miami. Saturday @ wounded Virginia. I agree-this one tops the Miracle on Main. Everybody has a favorite play. Mine was Montrezl’s QB-like fake hand-off to CJ at the top of the key and his quick turn and drive to the basket. Deft and unique, NC was completely fooled. Cannot wait to get down to Miami to see our boys in action Monday.. Hopefully, not to spent from one of the great victories in Louisville history!!!!. Redstein, that was indeed a great play. Which I did mention. It was the +1 that tied it at 53. Footnotes! Bah! But a play worth repeating with assorted casts. No doubt: a joyous second-half and a damn good win for my Cardinals! I think this season could have gone south quickly had the Cards lost this one, especially if it had been another drubbing at the Yum!. I know: with Chris Jones, you take the good with the bad. He’s been brilliant during ACC play, but there seemed to be a lot of bad Chris Jones on the court last night. His preening for a full house at the Yum! and a national TV audience during the last twenty seconds of regulation was maddening. Yesterday, Wayne Blackshear was terrible. It’s as though the game goes around Blackshear or even passes through him. He’s a non-presence on the court sometimes—he’s there, but he’s not. I’ve given this considerable thought: Is it possible that Wayne Blackshear is a ghost? Blind Luck, as you have read, I have a different take on Blackshear. He’s most assuredly not we wanted or expected of a McD’s A-A. But I don’t think he’s “terrible.” For one, he plays really good defense. He doesn’t commit a lot of turnovers. Yesterday, he got a critical steal, two major rebounds at crunch time, and drilled what was arguably the most important shot of the game in OT. Very good last six minutes. Terrible first 8 minutes. Meh in between. And by the way, Dickens was once in the house, the Galt House. Wayne Foulshear has mastered the art of disappearing in big games. We all love the guy, L1C4 and all, but damn….his genius in this consistent ploy would draw applause from Houdini. How about our 3 bigs all at once with Trez at the 3, coupled with TR and CJ? Our offense couldn’t be any worse, right? I shall be vindicated about Blackshear. What I know is he started for a national champion. And he’s starting for a decidedly imperfect team that is 18-3 and legit Top 10. And for all the “nothing” that he supposedly contributed yesterday, he made four major plays late that were significant factors in the W.
I always post that the Cards will go as far as Rozier and Jones take us, but I will amend that to say I believe Wayne could be the key to a deep run in the Big Dance. Don’t count him out yet ! Carolina only had 11 made FGs in the 2d half and OT. Which was a nifty fake hand off, drive to the hoop. It’s not like U of L did a whole lot of scoring from then on either. After Harrell’s deuce tied it at 59 with 3:54 to play, only two more points were tallied in regulation, one by each side. By the by, Wayne didn’t play poorly. He was not “nowhere to be found.” He grabbed four boards, two of which later were key, as well as a significant steal with a half minute left in regulation. Where are you, Rob Hickerson, when we really need you? Calling the Unknown Musician.